After the ‘Straight Between The Eyes’ US tour dates, all the members of Rainbow had been given notice of dismissal by Blackmore and the management team; the highly likely Deep Purple reformation being the cause. Initially, with Blackmore and David Coverdale patching up their previous differences, Coverdale had been offered the vocalist position but he turned this down sensing major success with Whitesnake (a wise decision as it turned out). Deep Purple Mk 2 looked to be on the cards for getting back together but an alleged argument between Gillan and Blackmore over publishing rights/royalties scuppered the reunion. Blackmore promptly resurrected Rainbow and re-hired everyone with the exception of drummer Bobby Rondinelli, replacing him with Chuck Burgi. Roger Glover was too busy with his own solo album to get involved with song writing duties for ‘Bent Out Of Shape’ but was happy to play bass and produce as before, returning to Flemming Rasmussen’s Sweet Silence Studios in Copenhagen – Blackmore liked the guitar sound there. 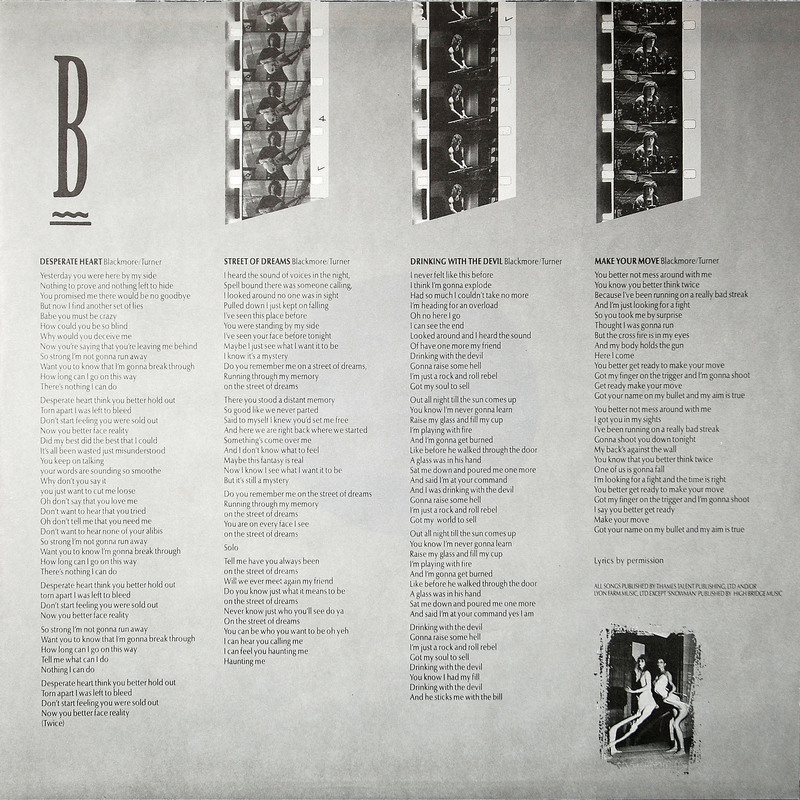 This album featured virtually all Blackmore/Turner compositions with only one song featuring Glover and Rosenthal as additional writing credits. 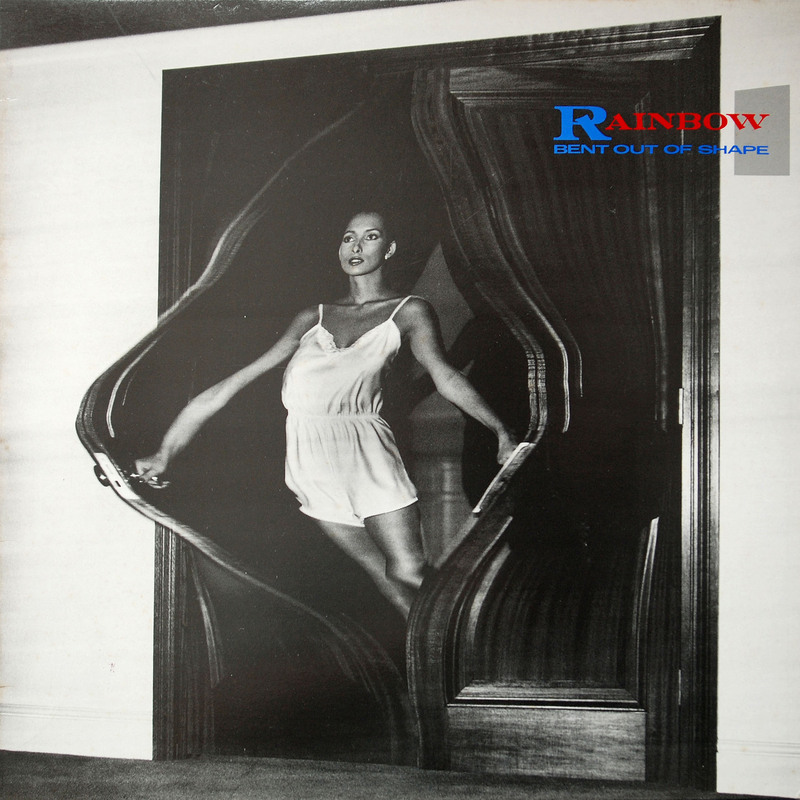 After touring this album in 1983 and early 1984, Rainbow finally disbanded after the Japanese dates with Blackmore and Glover joining the well publicised and long rumoured Deep Purple Mk 2 reunion with Gillan, Lord and Paice. ‘Stranded’ opens the album and sets the scene with a straight forward no-nonsense riff that works well. Blackmore’s solo style has definitely changed by this album, playing in a more staccato, less melodic way, but it remains very distinctive and individual. ‘Can’t Let You Go’ starts with an impressive church organ introduction that would have made for an interesting opener to the album. The guitar riff is quite laid back and features a lot more keyboards than normal. Superb vocals from Turner. Rosenthal received a writing credit but only for the organ introduction. ‘Fool For The Night’ is again a little rockier than some previous offerings. This is another better than average track but doesn’t set the album alight. Distinctive octaver guitar solo from Blackmore. ‘Fire Dance’ features one of Blackmore’s best guitar riffs in years. Shame the chorus isn’t a bit more catchy? This could have been one of Rainbow’s best ever tracks. The song features a great keyboard solo from Rosenthal and a return to form with the guitar solo too. Impressive screaming ending from Turner! ‘Anybody There’ is another of Blackmore’s instrumentals, but really it just seems to be a reworking of previous similar instrumentals such as ‘Weiss Heim’ and ‘Vielleicht Das Nachster Zeit’. A bit pointless in my opinion. 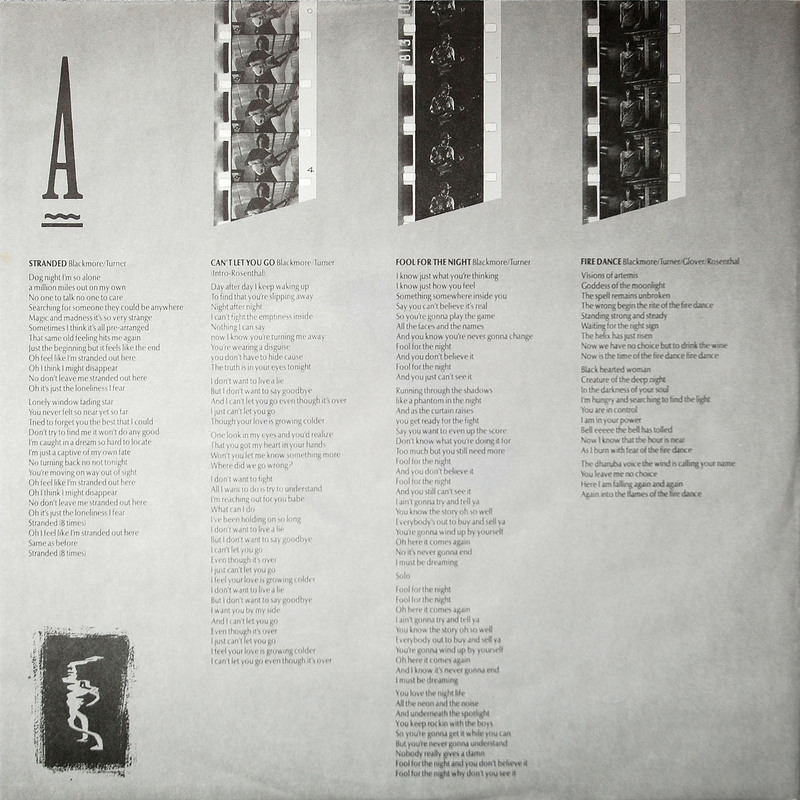 Side 2 opens with ‘Desperate Heart’, another melodic, well crafted song featuring plenty of keyboards again. The guitar is very laid back on this track though and it seems this could have been slated as a possible single as it is very ‘radio friendly’ with a strong vocal and melody. The guitar solo again features Blackmore revised method of playing in a more staccato style. ‘Street Of Dreams’ is next and is definitively the single off the album and proved to be another huge commercial success in the US. The video of the song featured a hypnosis sequence that resulted in the video being banned due to fears that the audience might be hypnotised! A superb Rainbow song and one of Turner’s best performances by far. 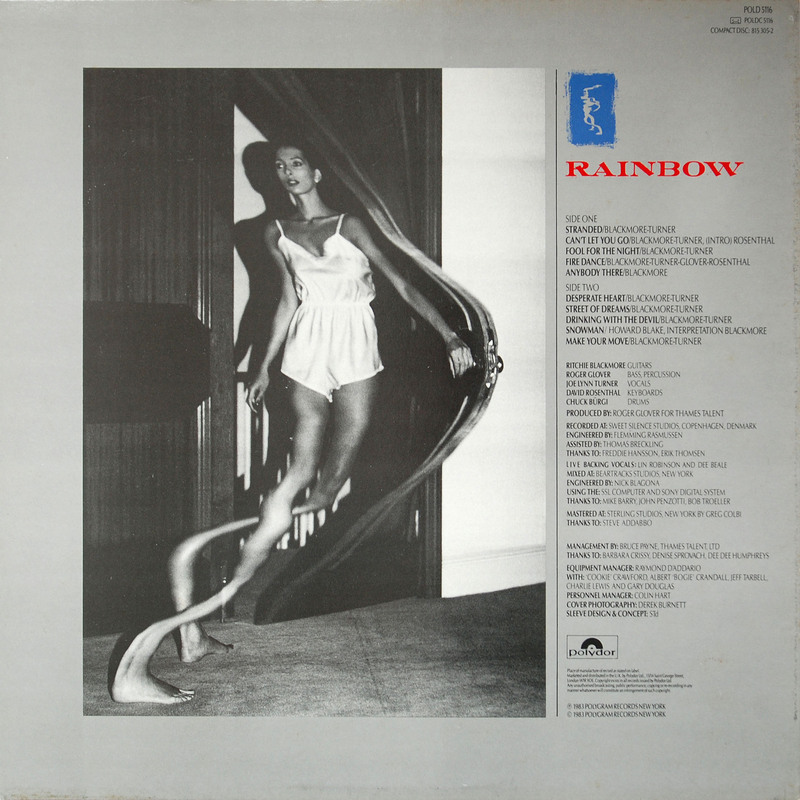 A very up tempo rocker follows with ‘Drinking With The Devil’, but it features a decidedly average chorus and arrangement that is far too predictable and not really worthy of Rainbow’s collective talents. Definite filler. Another instrumental follows: ‘Snowman‘, which initially is just keyboards and although moody and atmospheric doesn’t really deliver much until Blackmore’s superb guitar solo which hints a little of the solo on ‘Gates Of Babylon’. A pity there isn’t a bit more guitar throughout the track rather than just over the ending refrain. The album finishes with ‘Make Your Move’, which sadly also falls into the ‘filler’ category. A fairly pointless, meandering guitar solo punctuates a fairly pointless and forgettable song. The ‘Can’t Let You Go’ intro is, although completely different, as much a classic as the ‘Tarot Woman’ one.